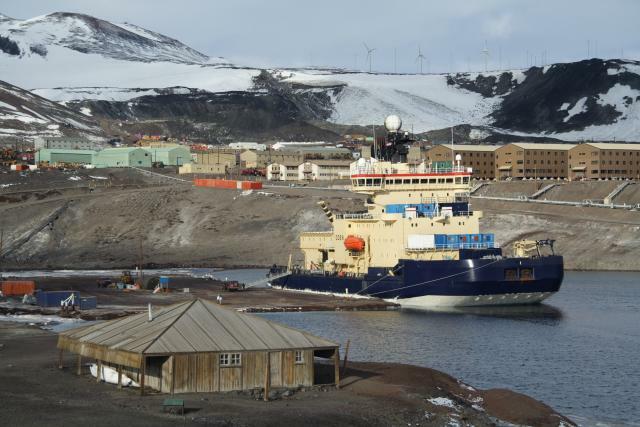 Swedish Ice Breaker Oden docking in McMurdo Station, Antarctica. The Oden is one of the most powerful, non-nuclear icebreakers. It has a specific shaped bow that allows it to break ice and manuver in dense ice cover. The Oden operates mostly in the Arctic and the Baltic Sea but also works sometimes in the Antarctic, e.g. to open a channel to the U.S. research station McMurdo.